Summary⎙ Print Faced with threats from damming projects, Arabization and marginalization, Nubian communities in Egypt and abroad are exerting efforts to preserve their language and unique cultural heritage. CAIRO — The Egyptian Foreign Ministry said Sunday that it had summoned the British ambassador to object to his comments on a recent court ruling to jail two journalists, escalating the government’s defense of its crackdown on dissent. The two journalists, Mohamed Fahmy and Baher Mohamed, have attracted special attention because, unlike most journalists in Egypt’s jails, both have had long careers at respected international news organizations. Mr. Fahmy is a Canadian who recently renounced his Egyptian citizenship and Mr. Mohamed is Egyptian. A third journalist convicted with them, Peter Greste, an Australian, was deported this year. Several other citizens of Western countries, including from Britain, were convicted in absentia in the same case. All face probable arrest if they return to Egypt. The case centers on allegations that Mr. Fahmy, Mr. Mohamed and Mr. Greste, who worked together for the English-language division of Al Jazeera, conspired with the Muslim Brotherhood to broadcast false news in order to destabilize Egypt. 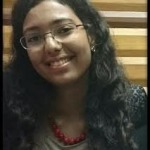 But the prosecutors have not presented any evidence of either collaboration with the Brotherhood or erroneous broadcasts. Mr. Fahmy, Mr. Mohamed and Mr. Greste were initially jailed at the end of 2013, a few months after Abdel Fattah el-Sisi, now president, led a military takeover. In January 2015, an appeals court ordered a retrial. Mr. Greste was deported at the beginning of February, and Mr. Fahmy gave up his Egyptian citizenship in the expectation that he, too, would be sent home. Instead, he and Mr. Mohamed were released on bail pending a retrial. On Saturday each was resentenced to at least three years in prison, and both are behind bars again. Several Western governments — including the United States, Canada and Britain — issued statements in English that condemned the ruling, saying it would undermine stability in Egypt by damaging public confidence in the rule of law and the freedom of expression. The British ambassador, John Casson, attended the court session on Saturday and said much the same thing, that the verdict would “undermine confidence in the basis of Egypt’s stability.” Mr. Casson, however, made his comments in fluent Arabic, in front of Egyptian television news cameras. “Egypt does not need lessons from anyone,” the statement added. In his ruling Saturday, Judge Hassan Farid said that Mr. Fahmy and Mr. Mohamed did not qualify for legal protection as journalists because they had not received authorization by the Egyptian government. The government has shut down Egyptian operations of their parent network, Al Jazeera, which was sharply critical of the military takeover and sympathetic to the ousted President Mohamed Morsi of the Muslim Brotherhood. “How can the judge say they are not journalists?” Mr. Mohamed’s wife, Jehan Rashed, said in an interview Sunday, noting that her husband was registered for years as a journalist for a major Japanese news organization. Separately, the election authorities announced a schedule for parliamentary elections expected to take place in two stages this fall, in mid-October and mid-November. Within the framework of the South Assassif Conservation Project on Luxor's west bank, an Egyptian-American stumbled upon a 26th dynasty tomb that belongs to the vizier of Upper Egypt, Badi-Bastet. Mahmoud Afifi, the head of the Ancient Egyptian Antiquities Department, explained that the tomb was found inside the tomb of Karabasken, who was Thebes' ruler and the fourth priest of Amun during the 25th dynasty (TT 391). Afifi went on to say that the archaeological survey carried out recently on the court of Karabasken tomb shows that several architectural designs and paintings were made especially for Badi-Bastet as it bode well to his fine and important position in the governmental echelon. 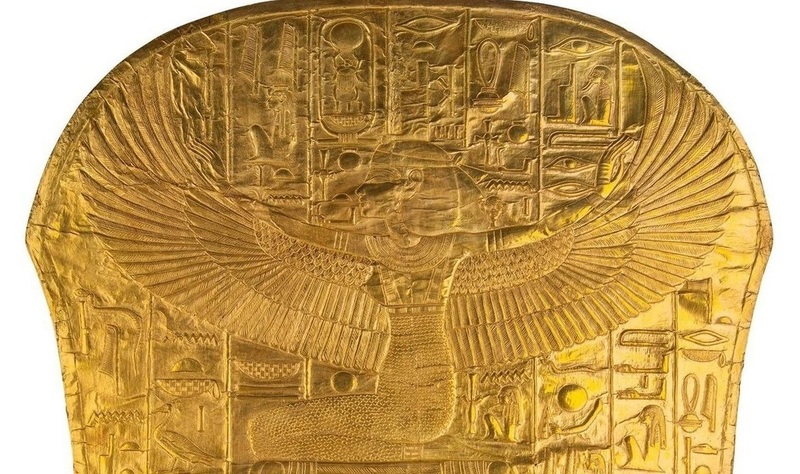 "Badi-Bastet could be buried in a shaft inside the court or in a main burial chamber of Karabasken tomb," the head of the mission Elena Pischikova suggested. She asserted that further cleaning of the tomb's different sections and the continuation of the archaeological survey would definitely reveal more secrets of the tomb. Studies carried out on Badi-Bastet's different titles reveal that he was one of the grandsons of Babasa, a nobleman whose tomb is located east of Assassif (TT279). The Egyptology community in Egypt and abroad was both shocked and outraged last year when a British museum sold the 4,500-year-old Sekhemka statue it had acquired from a Briton who took it during a visit to Egypt in the 1850s. It is now even more angered as time is running out for someone to buy the precious artifact before its export ban expires and it leaves the U.K. for good. However, the Sekhemka statue is not the only ancient Egyptian antiquity wrongfully taken or given away, many prominent pieces have been residing away from their rightful homeland for decades. Despite Egypt’s continued efforts to reclaim many of these masterpieces, the cities that have made them their own landmarks and the museums that profit enormously from displaying them continue to refuse giving them up. The iconic 3,300 year old limestone bust of the famous Egyptian queen was discovered by German archaeologist Ludwig Borchardt discovered in 1912 in Egypt’s Amarna and shipped off to Germany. It is now displayed at the Neues Museum in Berlin. The former head of Egypt’s Supreme Antiquities Council, Zahi Hawass, repeatedly tried to bring back the bust along with several other pieces in this list but to no avail; he even requested its temporary loan to an Egyptian museum in 2007. The famous inscribed stone, which helped decipher Egyptian hieroglyphics, was discovered by a French soldier during the French expedition to Egypt and then taken by British troops in 1801. It has been the highlight of the Egyptian collection at the British Museum since 1802. The limestone bust is a rare true portrait of King Khufu’s brother, it was created by one of the masters of ancient Egyptian art in the Old Kingdom. Discovered by a U.S. museum expedition in 1925, it is now displayed at the Museum of Fine Arts in Boston. The masterpiece is a famous ceiling sculpture that is considered the only complete map of the ancient sky; it is an ancient Egyptian representation of the astrological calendar. It was removed and taken from the ceiling of the Dendera temple by a French antique dealer in 1821 and is now displayed at the Louvre in Paris. The intact and life-size statue of the architect who built the Great Pyramid of Giza was discovered in 1912 by a German and Austrian expedition and is now displayed in the Roemer and Pelizaeus Museum in Hildesheim, Germany. The 23-meter-high 19th dynasty Egyptian obelisk is the centerpiece of the Place de la Concorde in Paris. Referred to as the “Paris needle,” it was originally from the Luxor Temple and was gifted to France by Muhammed Ali Pasha of Egypt in 1826. The small colored shrine statue, which depicts the 18th dynasty king and queen holding hands in a rare portrait, is considered one of the main highlights of the Louvre’s Egyptian collection. The 18th dynasty Egyptian obelisk, referred to as “Cleopatra’s needle,” was made for the Pharaoh Thotmes III in 1460 BC. It was transported to England in 1878 and now resides on the Victoria Embankment near the Golden Jubilee Bridges in London. The painted limestone sculpture of a sitting scribe is considered one of the most significant symbols of ancient Egyptian art. It was discovered by a French archaeologist in 1850 and is now displayed at the Louvre. After the first Egyptian obelisk was erected in Paris, followed by the second one in London, the United States was determined to get one of its own. Also referred to as “Cleopatra’s needle,” it is the twin of the London obelisk and was secured in 1879 by then American Consul General in Cairo Elbert E. Farman. It now sits in Central Park in NYC as the city’s oldest artifact. Penn Museum displays one of the oldest fragments of the gospel of Saint Matthew. You have a rare chance to see some of the world's most important religious writings in Philadelphia in the next two months. The Penn Museum has opened an exhibit, "Sacred Writings: Extraordinary Texts of the Biblical World," to coincide with Pope Francis' visit to Philadelphia next month. One item is one of the world's oldest fragments of the gospel of St. Matthew. Written in ancient Greek on papyrus and dating to the 3rd century, it was once part of a codex, and contains the beginning of the Gospel of Matthew including the lineage of Jesus and how Mary became with child by the Holy Spirit. "This is one of the oldest gospel fragments in the entire world," says Jennifer Wegner, an associate curator at the Penn Museum. "What has always struck me is people's reaction to this fragment and that such a humble looking manuscript evokes such reverent and awe-filled responses." The museum possesses the rare fragment because it jointly sponsored the excavation of the site in Egypt where it was discovered in 1897, Wegner says. "The archaeological site was renowned as an early center of Christianity," she says. "They started excavating ancient mounds, and they turned out to be trash mounds. The second day they found this fragment." Archaeologists ultimately discovered tens of thousands of papyrus fragments at the site, from biblical texts to tax receipts. The exhibit at the Penn Museum, formally known as the University of Pennsylvania Museum of Archaeology and Anthropology, includes religious artifacts that span more than 3,000 years and represent 13 languages. They will be on view through Nov. 8. The oldest artifact is a clay tablet that recounts a historical flood. It's written in Sumerian cuneiform that dates from 1650 BCE. "There is a thrill in seeing this flood tablet and thinking about how it came to be," says Steve Tinney of the Penn Museum. "Nearly 4,000 years ago, a highly trained scholar sat in a sunny courtyard, rolled out a piece of clay and let it dry. He sharpened the point on his stylus and wrote a story that was deeply meaningful to him about a flood." The tablet, found at the site of Nippur in Mesopotamia (in modern-day Iraq), contains the earliest version of the Mesopotamian flood story. A version of this tale becomes incorporated into the "Epic of Gilgamesh," an ancient epic poem, and tells of a flood that destroyed humankind, paralleling the biblical story of Noah. The tablet is grouped with other variations of the flood story from other cultures and religions and shows how the flood story has resonated through time. Julian Siggers, director of the Penn Museum, says, "The upcoming visit by Pope Francis provided a great opportunity to put together a small but important exhibition. These are spectacular texts of enormous significance." Most of the artifacts are from the museum collection and from the Penn Libraries collection of rare books and manuscripts. The exhibit includes the first complete Bible printed in the New World in a Native American language, says Mitch Fraas, a curator at Penn Libraries. The Eliot Indian Bible, printed in 1663 by Puritan missionary John Eliot, was written in the Algonquin language. It was the largest and longest book to be published in North America for the next 100 years, Fraas says. Another highlight is the first authorized Roman Catholic translation of the New Testament, which was written by Catholic exiles in northern France escaping persecution in England in 1582. Two folios from an illuminated Quran from Iran, copied and signed by its scribe in Hamadan in 1164, show a connection between major religions. The pages in the exhibit feature Surah Nuh (Noah), with a mention of the Flood and Noah's role as admonisher. The copy is written with black ink in cursive Naskh Arabic script, and features the complete text of the Quran, with commentary in red script. You can also see an illuminated Latin Bible produced in Arras, France, in the late 13th century. The hand-decorated Bible shows vividly colored illustrations of Jesse with King David, Solomon, Mary and Jesus. "This is a beautiful illustrated Bible," Fraas says. Then there's a 15th century Medieval History of the World that starts from the Creation to the election of Pope Sixtus IV in 1471. It shows an enlarged diagram of the ark associated with the biblical story of Noah. "It shows the importance of the flood story in the world's history," Fraas says. "We wanted to take the stories told forward in time through the texts." A display also compares side-by-side the flood stories from the Quran, Genesis, Epic of Gligamesh and the Sumerian flood tablet. The newest text is from 1999 and is "as much a piece of artwork as it is a text," says Fraas. The Moser Bible, which took three years to produce, is filled with original engravings by artist Barry Moser. Siggers says the staff hopes the exhibit will serve as a gateway into the museum's other exhibits, which focus on the ancient Near East, Egypt, Canaan and Ancient Israel and provide visitors a look into ancient cultures and biblical-era art and artifacts. H. Carton Rogers, director of libraries at the University of Pennsylvania, says the exhibition, which includes texts from Christianity, Judaism and Islam, follows the goal of the World Meeting of Families in Philadelphia, which Pope Francis will attend. "We hope this exhibit helps to overcome differences so we can work together toward the mission and vision of peace," Rogers says. •When: 10 a.m.-5 p.m. Tuesdays through Sundays, through Nov. 8. The museum will close at 4 p.m. Sept. 25 and be closed Sept. 26 and 27 during Pope Francis' visit to Philadelphia. 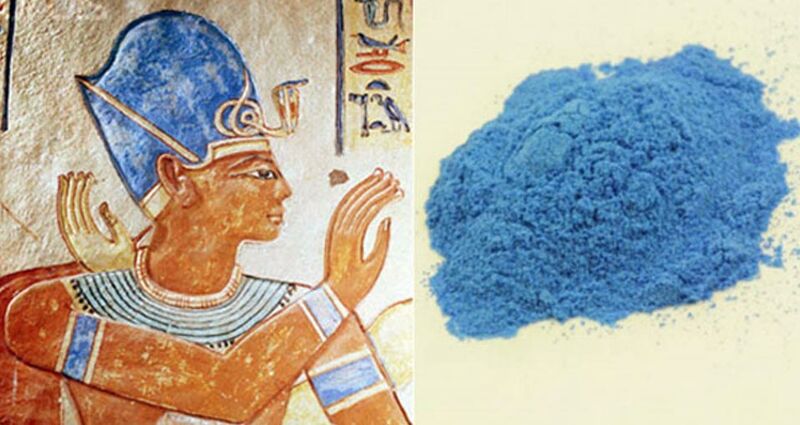 Egyptian Blue is one of the first artificial pigments known to have been used by man. First created around 5,000 years ago by heating a mixture of a calcium compound, a copper-containing compound, silica sand and soda or potash to around 850-950 C, the precious pigment was reserved for the most exquisite of artworks. In Egyptian belief, blue was considered the color of the heavens, and hence the universe. 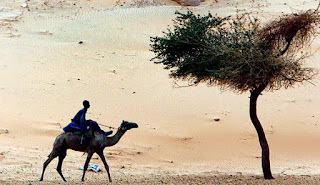 It was also associated with water and the Nile. However, scientists have now found traces of the rare pigment behind drab-colored mummy portraits, leading to a new understanding of how this particular pigment was used by artists in the second century A.D. The 15 Egyptian Mummy portraits and panel paintings date from the Roman era. They have rested undisturbed for the last 100 years but scientists and art conservation specialists from Northwestern University and the Phoebe A. Hearst Museum of Anthropology have now dusted them off and begun to investigate. The collection was excavated between December 1899 and April 1900 at Tebtunis (modern Umm el-Breigat) in Egypt’s Fayum region. It includes 11 mummy portraits and 4 panel painting fragments which are now kept at the Hearst Museum at the University of California, Berkeley. The mummy portraits are extremely fragile. They are lifelike paintings depicting specific individuals which would be incorporated into the mummy wrappings and placed directly over the person's face. This style of artwork appeared in Egypt during the 1st Century AD, remaining popular for around 200 years. In some cases, it has been possible to date the mummy from the hairstyles, jewellery and clothing depicted in the portrait. The team discovered that the materials used on six of the 15 paintings by the painters nearly 2,000 years ago included Egyptian Blue pigment which they used for the underdrawings and for modulating the colour. The discovery is a complete revelation, given that Egyptian Blue has to be manufactured and so is normally reserved for precious artworks and goods rather than hidden beneath other colours. Roman-era Egyptian mummy portraits from the site of Tebtunis, Egypt, with no apparent blue color, but under testing, researchers found the synthetic pigment Egyptian blue present in all three paintings. Credit: Phoebe A. Hearst Museum of Anthropology, University of California, Berkeley. Egyptian Blue was used extensively throughout the Mediterranean before the Greek period, particularly in frescoes, on temple walls and other locations in order to depict the night sky. It was initially developed by the Ancient Egyptians around 3200 to 3000 BC and was made from silica, lime, copper and alkali. The pigment was the first to be made artificially and was inspired by the naturally occurring lapis lazuli, a semi-precious stone that is coloured deep blue with golden flecks of pyrite, creating a shimmering effect resembling stars in the sky. Although commonly associated with Ancient Egypt, lapis lazuli was also used to fashion jewellery and other items in Mesopotamia, Persia, Greece and Rome. Egyptian painting with an obvious use of the pigment Egyptian Blue. 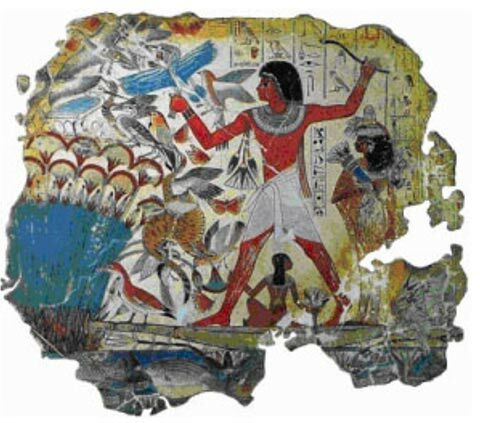 ‘Hunting in the marshes’ (fragment), tomb chapel of Nebamun. Credit: British Museum. When the Greek painters rose to prominence in the ancient world they utilised mostly yellow, white, black and red, the four colours in their palette. The Greek painters were considered to be masters of the art, causing the Romans to try and emulate them. As a result, Egyptian Blue was dropped from the Roman palette, or so it has been thought until now. The collaboration between the two groups of specialists is part of the Northwestern University-Art Institute of Chicago Center for Scientific Studies in the Arts (NU-ACCESS), where Walton is a senior scientist. According to art conservator Jane L. Williams, who is employed by the Hearst Museum and a co-author of the study alongside Walton, the findings confirm the distinction between the visual and physical natures of artefacts. The painters manipulated a small palette of pigments, including Egyptian Blue, in order to create a much broader spectrum of colours. Williams had a range of unanswered questions about the paintings concerning the materials and techniques used by the artists. However, Hearst Museum does not have a conservation science division and so working with the scientists from NU-ACCESS has enabled a comprehensive technical survey of the paintings, including the use of the latest technology for non-destructive analysis. A set of analytical techniques, such as such as X-ray fluorescence and X-ray diffraction, allowed the team to uncover the surprising way in which Egyptian Blue was used. The team have published their findings in the journal Applied Physics A, which is dedicated to materials science and processing. The research is ongoing and will contribute to Ancient Panel Paintings: Examination, Analysis and Research (APPEAR), an international collaborative study project initiated by the J. Paul Getty Museum. APPEAR is aiming to create an international digital database incorporating historic, technical and scientific information on Roman Egyptian portraits. Featured image: Left: Egyptian blue shown in an image of Ramses III 1170 BC. Image source. Right: Egyptian Blue pigment. Image source. Despite its importance today, health care in the past is difficult to identify even though it played an important role in the health of past populations. Ancient Egypt is an ideal place to conduct a case study on the archaeology of health care due to pervasive concerns regarding health and mortality in ancient Egyptian thought. Previous research through both medical texts and human remains has identified the kinds of illnesses and treatments present in ancient Egypt, yet these studies tell us relatively little about health care. In essence, we know how people died in ancient Egypt, but what helped them to survive? 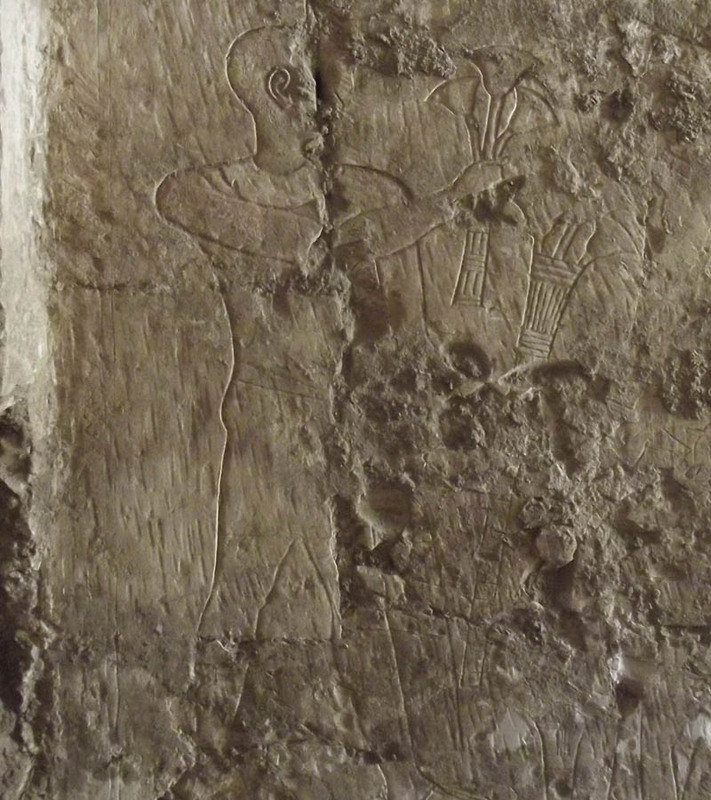 In this talk, Anne Austin explores two unique data sets to identify both illness and care at Deir el-Medina, the village of the workmen who cut and decorated the Egyptian royal tombs of the New Kingdom (1550-1070 BCE). First, she evaluates the village's extensive administrative, personal, and medical texts in order to identify what texts can tell us about disease and care. Second, she offers the first and only research on the New Kingdom human remains from the site that demonstrates differences in the illnesses and health statuses of its inhabitants. Anne Austin is a Postdoctoral Mellon Fellow in the History Department at Stanford University. She received her B.A. in Anthropology from Harvard University, and she earned her M.A. and Ph.D. in the Archaeology program at UCLA. Long after Egypt's other gods had faded into obscurity, the goddess Isis was still worshipped far beyond Egypt's borders, throughout the Mediterranean, well into the 6th century. Temples to Isis were built in Iraq, Greece and Rome, with a well preserved example discovered in Pompeii, originally built during the reign of Emperor Augustus. This, together with the lengths that she went to in protecting their son, Horus, saw Isis revered as the ideal loyal wife and devoted mother. 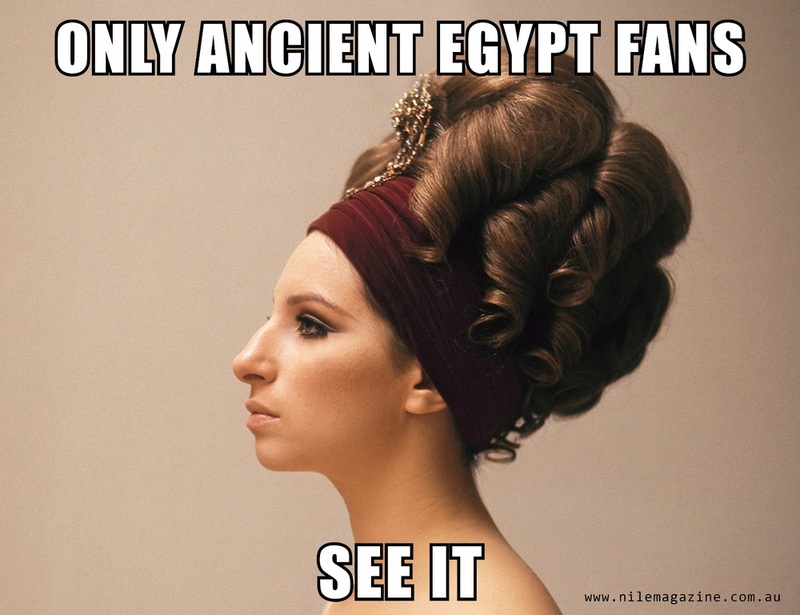 Isis is normally depicted as a woman wearing a tight dress, with her name hieroglyph on her head. 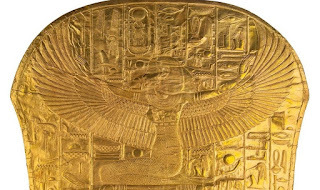 Here she kneels at the base of the foot of the middle coffin of Tutankhamun, her wings spread in protection. This is the second of the three coffins that were originally placed one inside the other in Tutankhamun's tomb. In myth, Isis is often portrayed as a mourning widow at either end of Osiris' body, whom she magically revives as a mummy so as to conceive their son, Horus. This is why Isis is often pictured at the feet of coffins, as all kings become Osiris in death. Isis' presence provides powerful restorative magic that helps in the king's resurrection in the afterlife. Tutankhamun's gilded middle coffin is in the Egyptian Museum, Cairo (JE 60670). 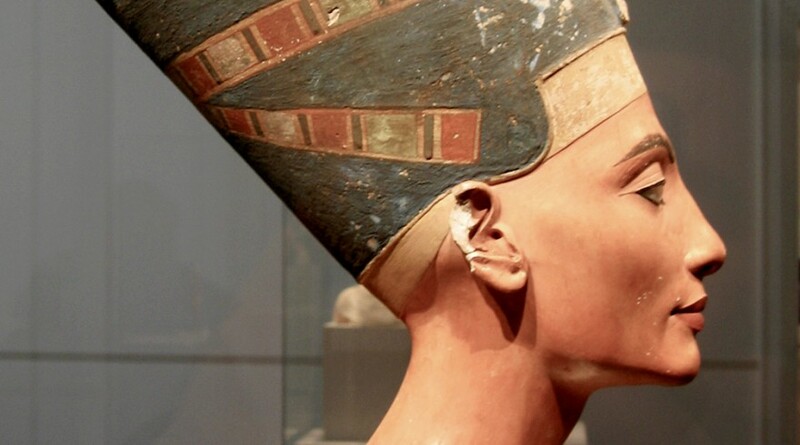 Nefertiti was the Great Royal Wife of Akhenaten, a religious idealist who used his absolute power as pharaoh to promote his favourite god above all others – Aten, the power emanating from the sun's disc. Fig. 1. The area of KV 40 and KV 64 in 2009. Fig. 2. KV 40, room D, square G2. Fig. 4. Storage jar with inscription from KV 40. Fig 8. Pottery from KV 33 reassembled. Fig. 9. 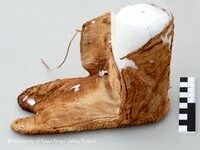 Pharaonic sock during conservation and consolidation work. 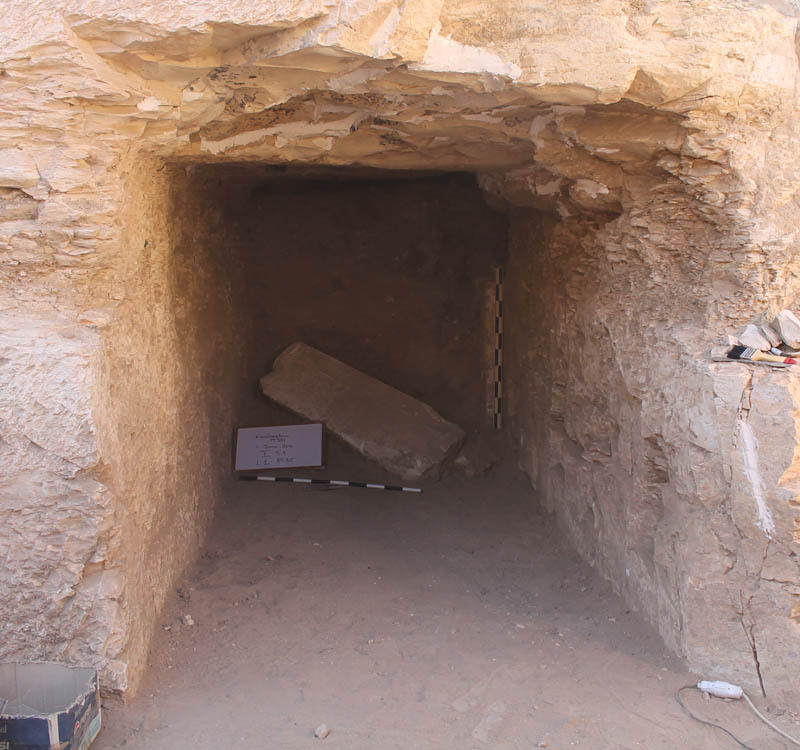 Work related to the study of the undecorated non-royal tombs in the side valley leading to KV 34 of Thutmosis III was carried out between November 2013 and April 2014. We would like to express our sincere thanks to the Minister of State for Antiquities Dr. Mohamed Ibrahim and the Secretary General Dr. Mustafa Amin, to the Director of Foreign Missions Dr. Mohamed Ismail Khaled, to the General Director of the Antiquities of Egypt Mr. Ali El-Asfar, to the General Director of Upper Egypt in Luxor Mr. Abd El-Hakim Karrar, to the General Director of Luxor East and West Mr. Ibrahim Soleiman and to the General Director of Luxor Sultan Eid and to the Inspectorate of Western Thebes and its General Directors Dr. Mohamed Abd El-Aziz and Talaat Abd El-Aziz, to the Director of the Westbank Mr. Nour Abd El-Ghaffar, to the Director of the Valley of the Kings Mr. Ayman Mohamed Ibrahim and the inspectors Mr. Mohamed Asab, Alaa Hussein Mahmud and Ahmed Abu El- Kassim for their helpful cooperation, assistance and advice during our working season. Participants during this season were: Susanne Bickel: Project Director, Egyptologist; Elina Paulin-Grothe: Field-Director, Egyptologist; Tanja Alsheimer: Archaeologist; Agnieszka Wos-Jucker: Textile Conservator; Erico Peintner: Conservator; Mataz Kacicnik: Photographer; Faried Adrom, David Aston, Miriam Hauser, Salima Ikram, Nadine Meier, Yasmin Müller, Hans-Hubertus Münch, Daniel Reber, Katharina Vogt: Egyptologists; Frank Rühli, Anatomist-Palaeopathologist. History of the work in KV 40: No previous record of archaeological research on KV 40 is known (fig. 1). Work of the University of Basel Kings’ Valley Project began in 2011 with the clearing of the shaft A and of the corridor B and with a pre-clearing survey of room C. A protective structure was installed to cover the shaft entrance, this intervention leading to the discovery of KV 64 immediately next to KV 40. In 2012 room C was documented and cleared. In 2013 a pre-clearing survey and photographic survey was realised of room D, E and F and part of room D was cleared. This season, after a revision of the pre-clearing documentation (fig. 2), rooms D, E and F were cleared following a pre-defined grid of rectangular quadrants. 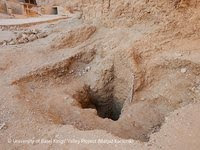 This large tomb structure contained important quantities of pottery, fragmentary burial equipment of wood, cartonnage, and textile, as well as human remains (estimated about 50 individuals). Due to at least three robbing and looting phases in Antiquity and in the 19th/early 20th century, and as a result of the fire that affected all rooms, the remains are in a very disturbed and fragmentary condition (fig. 3). The analysis of the remains will be the main task of the following seasons. 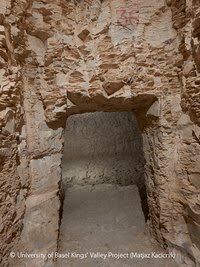 A preliminary overview of the material shows that the tomb was used for multiple interments during two distinct phases, one in the 18th dynasty, and one in the 22nd dynasty. 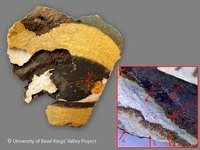 The original tomb owners of KV 40: During the current field season, KV 40 could be identified as the burial place of members of the families of the pharaohs Thutmosis IV and Amenhotep III (ca. 1400-1350 BC). Among the very abundant pottery fragments, some sherds bear hieratic inscriptions in black or yellow paint (fig. 4). A preliminary study of these inscriptions has revealed the identity of over 30 individuals buried in KV 40, among which at least eight wear the title of "King's daughter" and four the title of "King's son". Taking into account the textual evidence as well as the material setting of KV 40, it appears that this tomb served as burial place for people of the royal family, for both children and adults. Among the human remains, several new-borns or small infants could be identified; their elaborate mummification points to their high-status background. Next to princesses, princes and individuals without titles, the jar inscriptions reveal another group of people, namely foreign women designated as such by the orthographic determinative affixed to their hieroglyphic names. They can tentatively be connected with the numerous women who accompanied the foreign princesses whom the pharaohs brought to the Egyptian royal court in course of diplomatic marriages and who presumably also lived in the royal living quarters. With this discovery, the University of Basel Kings' Valley Project fills an important gap in Egyptological research, insofar as the individuals buried in the non-royal tombs of this necropolis hitherto remained largely anonymous. Anthropological analyses as well as examination of the fragmentary burial goods will provide further insight into the social and ethnic structure of the pharaonic court during the 18th dynasty, as well as into the conditions of life and the burial customs. Conservation work mainly focused on the cleaning (removal of soot), consolidation and analysis of cartonnage fragments. Corresponding to the tomb structure’s two periods of use, two groups of cartonnage can be differentiated on the basis of technical and typological criteria: the first group includes fragments of linen cartonnage with black and yellow stripes belonging to funerary masks of the 18th dynasty. Different types of layering and application of raw material indicate the provenience of these masks from several workshops (fig. 5). Polychrome cartonnage fragments covered with an albuminous varnish can be attributed to the second group and belong to mummy containers of the 22nd dynasty. Fragments from wooden coffins were consolidated, and at least 11 types of different luting substances coming from the sealing of joints between wooden boards of coffins or furniture could be identified. 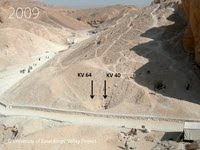 The architectural survey of tomb KV 40 was continued from previous seasons. The coordinate system set up by the Theban Mapping Project was adopted for the tomb and could be assigned to the subterranean structure via laser measuring down the 5,5m deep shaft. The geodetic and architectural survey of rooms C and D and E was successfully accomplished paying special attention to steps and entrances into the rooms as well as the specific door shapes of each room. Tomb KV 36 was discovered by Victor Loret in 1899, its burial goods are now in the Cairo Museum. It belonged to a young man from the royal nursery called Maiherperi. The tomb has a single chamber. A general survey was undertaken by the Theban Mapping Project in the 1980s. On request of the Egyptian authorities, the tomb and its immediate surroundings were cleared from large quantities of litter and sand. A pre-clearing survey was carried out, integrating some of the surrounding landscape features such as the mountain face outline and topographical levels in the immediate vicinity. Three survey points for absolute height were measured next to the shaft entrance in order to assist further clearing. 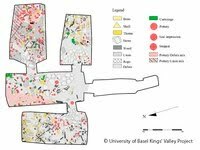 In the course of the work carried out during this survey, special care was taken to map specific features of the shaft of KV 36 such as the rock-cut mountain conglomerate lip that makes out the western side of the shaft (fig. 6). The entrance to the tomb chamber is marked by a bold red line of paint (fig. 7). The chamber itself is well cut. Fragments of three incomplete storage jars still remained, although it is unclear whether they were left there by Loret in 1899, or were introduced sometime later. An architectural and a topographical survey as well as an extensive photographic documentation were realised and a secure protective structure with an iron door installed at the entrance of the shaft. Tomb KV 59 was relocated and cleared in 2010. The documentation of the study material found mainly in the shaft and the surroundings of the small tomb was completed this season. KV 33 was cleared last year. Large amounts of pottery, some fragmentary stone vessels and wooden fragments were found. No object revealed the identity of the original tomb owner(s). The finds and study material from KV 33 – especially some fragments of fine “alabaster” vessels – were documented this season. The pottery assemblage shows a typological grouping of medium-sized bowls with red splash decoration on the one hand and at least 40 large storage jars which were probably used for the storing of mummification material on the other hand. Most of these vessels could be reconstructed from base to rim (fig. 8). 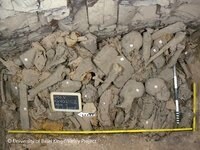 The high number of vessels might suggest that originally three people were buried in KV 33. Other vessel forms are rare: a delicate red-slipped carinated bowl with a black band at the rim, as well as a few larger carinated bowls with red rims, and a single flower pot came to light. Marl clay vessels were only represented by a handful of sherds. The overwhelming presence of red splash decoration and the similarity of the material to that from KV 31 indicate a dating for this pottery into the reign of Tuthmosis III. 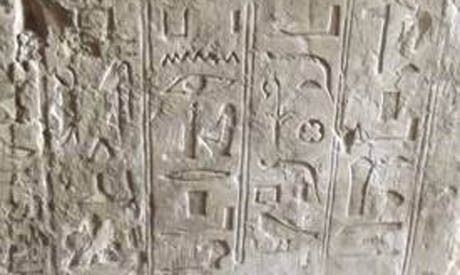 A complete architectural survey of the KV 33 was carried out, and the ground plan otline of the tomb was recorded alongside sections of all rooms. This data will be used for modeling a detailed 3D reconstruction of the tomb. Special attention was given to architectural features such as door shapes and step shapes, and to the debris lines still visible along the walls. The photographic documentation of KV 33 has been completed. The pottery from KV 30 is distinctly different from the one in KV 33 and KV 31, and there is no doubt that it belongs to a later pottery phase which developed during the reign of Amenhotep III (and continued down to the end of the Eighteenth Dynasty). Not much pottery has remained – only 43 vessels being numbered – but it comprised Nile clay pots, Marl clay vessels, and Canaanite imports. 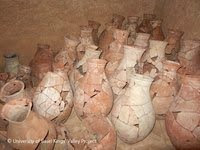 The Nile clay corpus included small plates, flower pots, a funnel necked jar, a solitary beer jar and at least three large storage jars which differ from the vessels found in KV 31 and KV 33 in being much wider. 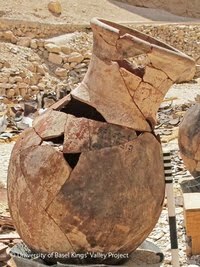 Besides this fragments of at least five Marl D amphorae were found, along with at least three LB IIB Canaanite Jars. 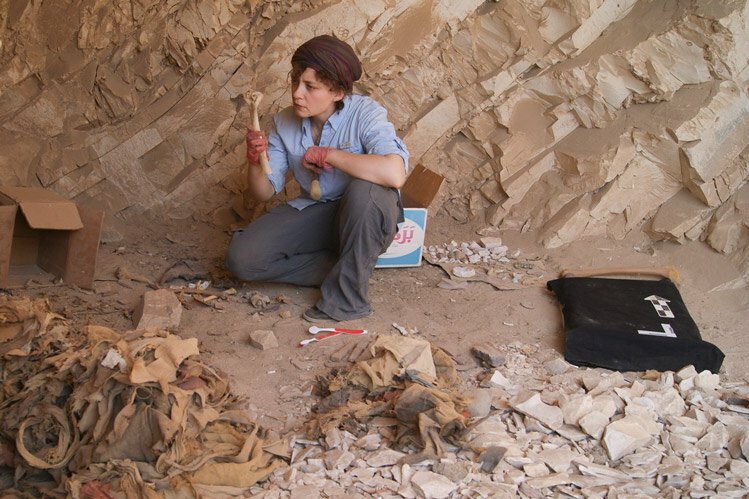 The analysis of the textile fragments from KV 64 was continued and is now completed. An evaluation of the various qualities of textiles and of the quantity of material involved in the mummification of one person is being prepared. In KV 40 an almost entire linen sock was found. It has been cleaned and consolidated by the textile conservator (Agnieszka Wos-Jucker, Abegg Stiftung Riggisberg/Switzerland), giving it back its original shape and appearance (fig. 9). Consolidation work on this item will continue next season. The photographic coverage of tombs KV 33 and KV 36 was completed and interactive panoramaic images of these tombs as well as of KV 64 were created. Finds from KV 64 were photographed for the forthcoming publication. In preparation of a publication (F. Rühli, S. Ikram, S. Bickel), the remains of the five mummies found in KV 31 were visually reassessed by Prof. Frank Rühli (University of Zurich). The description of the 18th dynasty mummy from KV 64 was refined. The intended x-ray investigation of both mummies from KV 64 had to be postponed. KV 31 contained an abundant ensemble of animal remains (mainly bovine and birds). 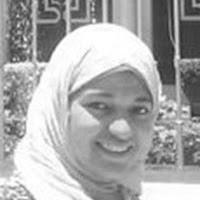 The identification, assessment, and preparation for publication was undertaken by Prof. Salima Ikram (American University, Cairo). Israel has announced that it will exhibit ancient Egyptian jewelry and antiquities which were discovered during excavations in Palestine at the Israel Museum in September. The artifacts include two sphinxes that were found two years ago in Tel Hazor, close to the Sea of ​​Galilee and the Syrian border. The first sphinx is 35 centimeters long, while only the feet of the second, which is two meters long, were found. There are also 250 lines from a letter that describe the type of gifts the kings exchanged, including gold perfume bottles, gold knives, gold bracelets, a large boat, gilded beds, gold cups, silver plates and ivory combs. Egypt ruled Canaan at that time, which included Palestine, Lebanon and southern Syria, and Egyptian artifacts were discovered in the ancient cities of Acre, Hazor, Megiddo, Lachish and Kiryat Gat. According to Dr. Arie, while some of those artifacts were part of the trade, others were gifts. “There are rare pieces made of a material called Egyptian blue, a color that does not exist in nature,” he said. He added that the two-meter sphinx is of King Menkaure, builder of the third pyramid, and that it was sculpted from a very heavy stone and brought to Canaan in 1,300 BC, after having remained in Egypt for more than a thousand years. He was not able to find an explanation for this move. Dr. Arie will also present a sword sickle, which was buried with its owner to use in the afterlife. It looks like the sword sickle that was found in the tomb of Tutankhamen which is displayed at the Egyptian Museum in Cairo. 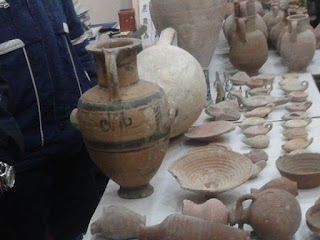 Ali Ahmed of the Egyptian Antiquities Ministry has said that if those artifacts are proven to have been smuggled out of Egypt, the Egyptian government will claim them.